Timber Rattler captures the beauty of a southwestern sunset with this exceptionally well designed Arizona Sunset fixed-blade bowie knife. 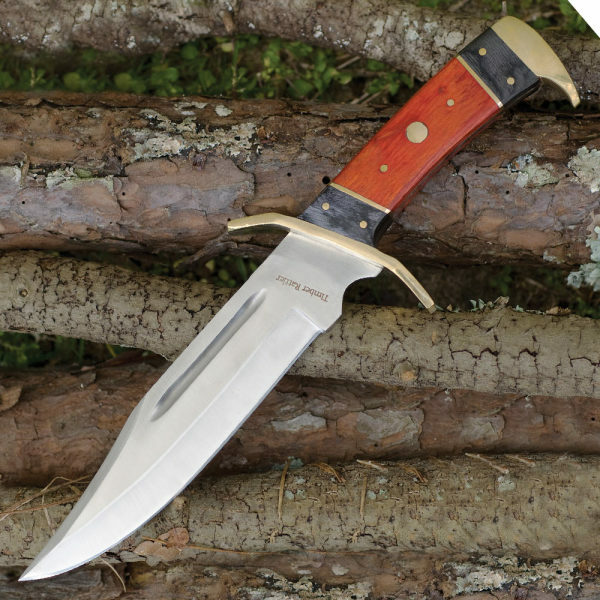 This traditional bowie knife features an imposing 11" blade crafted of stainless steel with a razor-sharp edge and piercing clip point. 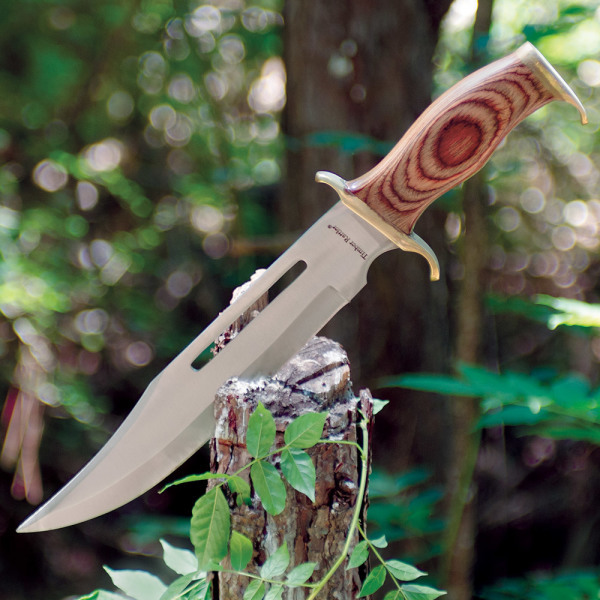 Besides the hefty, thick steel blade, the real story here is the custom-designed bone handle. The inlaid burnt bone features intricately detailed carvings accented by stacked leather and red pakkawood inserts and brass spacers that all mimic the colors of sunset. The brass hand guard features scalloped edges for additional elegance and attention to detail. A genuine leather sheath is included. 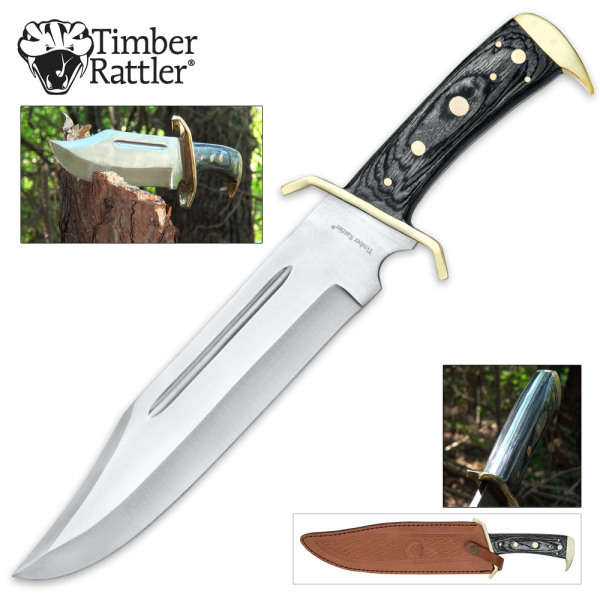 This Timber Rattler Outlaw bowie knife is one powerful full tang beast of a blade that every manly man needs. The full tang 11 3/8" stainless steel blade is razor sharp and will hack through anything life throws at you. Whether you're chopping trees or slicing through thick ropes, you'll get the job done fast with this Outlaw bowie knife. Each knife includes a handmade genuine leather belt sheath. Your friends will think you paid at least $100 for this classic piece of steel, so get yours today before they're all gone! Measures: 10 1/2" blade; 15 1/2" overall. The jungles are tough, but with the Timber Rattler Jungle Fury, it's not so bad. 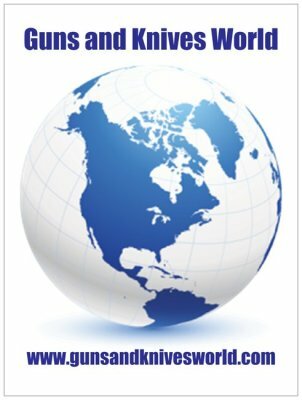 Take care of any problems with the 10 1/2" stainless steel blade with a cut-out blood groove and a razor-sharp edge. 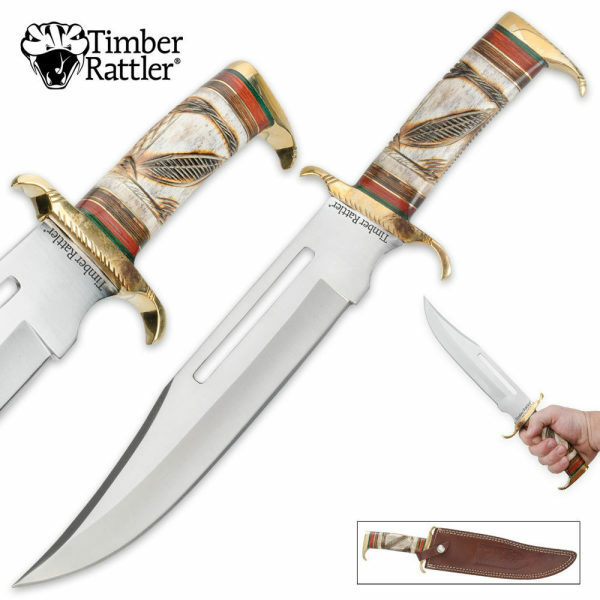 The Southwestern Hunter Bowie knife from Timber Rattler is a true natural beauty! The hand-carved designs on the pakkawood handle are intricate and feature intricate leaf designs. The handle is accented with green and brown pakkawood inserts, as well as, a brass pommel and bolsters. The stainless steel blade features a blade cutout and a razor-sharp edge. This knife is a true beauty that will look great in your collection! Overall lengths are 12" and 8"
Another full-tang masterpiece for the Sooner collection. 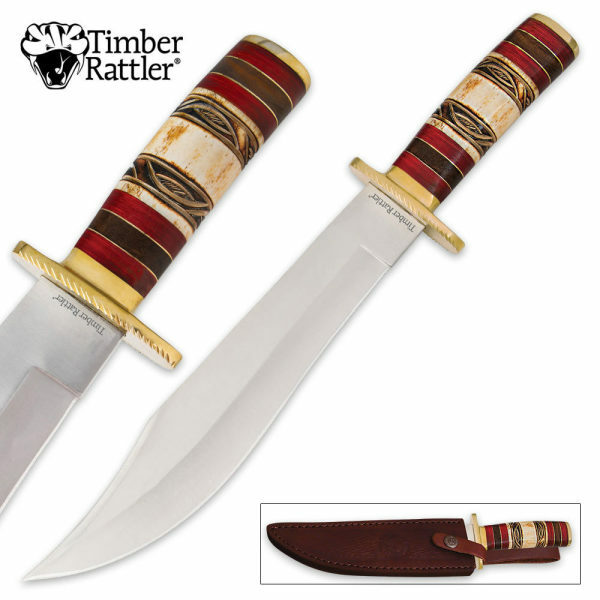 This 12" bowie offers a pakka wood handle complete with brass guard, pins and pommel. 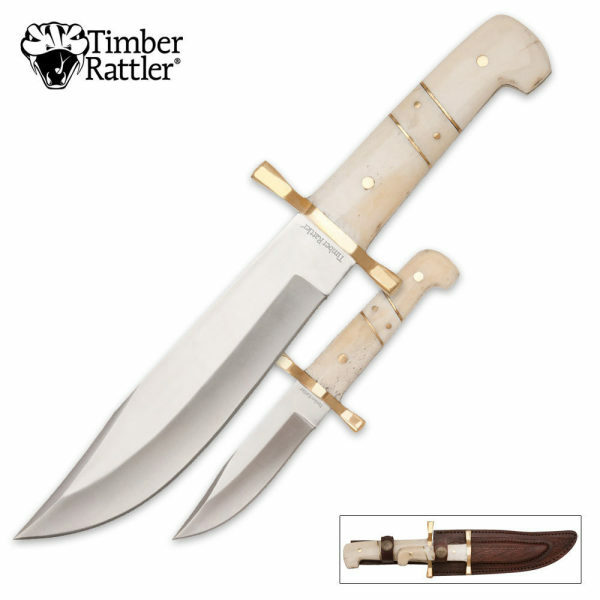 Include genuine leather sheath, which is held closed by a cast State Seal of Oklahoma snap button. 12" overall. 7 1/2" blade.